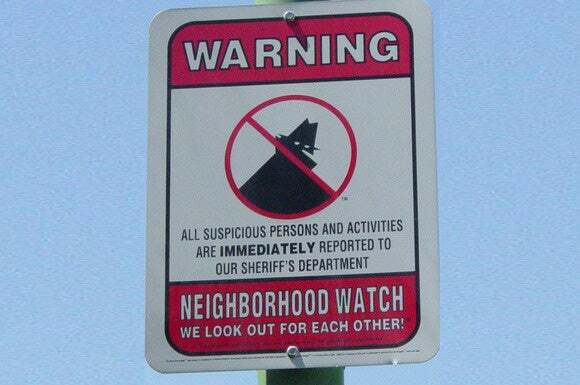 The Neighborhood Watch program is about to augment its wetware network of watchful eyes with a hardware network of wireless IP security cameras. The objective? Reduce false alerts to local authorities, improve emergency response times, and reduce crime rates. It all starts with the rollout of a new safety system that will use wireless, battery-powered cameras to monitor participating neighborhoods. Launching in June at the National Sheriff’s Conference, the new system will be offered to member neighborhoods of the National Neighborhood Watch program, and individuals interested in using technology to collectively monitor their community and homes, NextMarket Insights reports. The system isn’t too far removed from a typical home-security setup, albeit on a larger scale. It entails plugging a small hub into an Internet router and then strategically placing one or more SAF-T Cams in or around surrounding areas. The indoor models are about the size of a salt shaker, while the outdoor cameras are closer in size to a coffee mug. Since one camera probably isn’t enough for most neighborhoods, the system was designed to support up to two dozen more SAF-T Cams. The camera network operates on the unlicensed 900MHz frequency band to deliver longer range (low-frequency signals can travel farther and pass through physical objects more easily). When a camera detects movement, it begins recording and sends a short clip to a designated smartphone. The person in charge of the smartphone can then choose from three options: Dispatch, Disarm, or Dismiss. The Dispatch option will send the video to a central monitoring station, so that police can respond to the incident. The Disarm option turns the camera off and cancels additional alerts, a handy feature if a critter keeps triggering the camera. The Dismiss button archives the video, but leaves the system on for future alerts. Privacy advocates might take some comfort in knowing that videos and alerts are encrypted when they’re sent, though there still must be a level of trust that the people receiving the notifications won’t abuse the system. Why this matters: People are already using security camera systems for their homes, and some models are even designed for Neighborhood Watch deployment. But this is the first time that technology like this will be an official part of the program, and neighborhoods that take advantage of it will be better equipped to monitor trouble areas. What’s even more interesting are the potential side applications here. Michael Wolf, author of the aforementioned NextMarket Insights piece, previously wrote an article for Forbes that brings up some intriguing use-case scenarios for a smarter Neighborhood Watch. For example, what if residents could opt in to receive alerts from these cameras? If they’re away from home and are alerted to suspicious activity in their neighborhood, they could tap into their smart home infrastructure to turn on the lights and/or television to make it seem like someone is inside. Or if they’re already home, an alert could prompt all doors to lock. Paul Lilly is a freelance technology writer and an avid Boston sports fan.